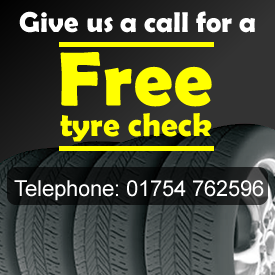 Number 1 in Skegness for New Part worn and Used tyres. We stock over a thousand of part worn tyres in our warehouse, offering popular named brands such as Pirelli, Bridgestone, Michelin, Continental, Dunlop, Goodyear, Yokohama, Hankook, Firestone and Falken. Each of our tyres are fully tested over a 24-hour period, not 4-5 minutes on a machine like other companies this ensures that you receive only the highest quality tyres. We cater for car, van and 4×4 vehicles. We offer ample parking and you can leave you vehicle with us in a safe and secure car park which is covered with 24hour CCTV and you may collect at a time convenient to yourself. We have a 3.5tonne two poster lift to enable us to change all four tyres in one go and inspect the vehicle where required, still leaving us ample room to work on another vehicle inside the workshop or outside weather permitting.